Bleeps, bloops, and pixels: the cornerstones of classic gaming. The innate addiction coded within the circuit board-powered arcade cabinets and NES cartridges render them precious artifacts, their primitive graphics and relative brevity revered even today. But why is that the case? Join Anthony on his 8-Bit Chronicles, wherein he studies the industry’s building blocks in famous coin-munchers, failed experiments, and obscure gems. Today’s review is based upon the original arcade Pac-Man included within PlayStation 3’s PSOne Classic re-release of Namco Museum, originally released for PlayStation. Good god, is that yellow gremlin up there supposed to be Pac-Man? What’s with the stubby feet? The bulbous bloodshot eyes? 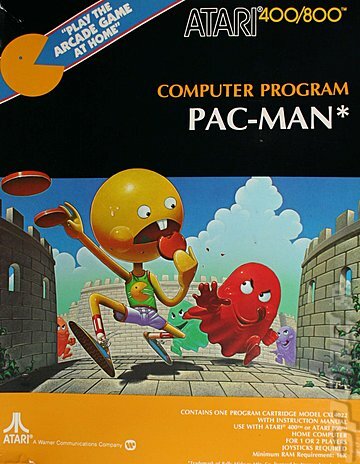 True, Midway’s take on the arcade mascot might not be the worst iteration out there — Hiro Kimura’s nerdy jock for the Atari 400/800 cover obscures a half-decent port, and like most, I’m reduced to ghastly sputtering at the mere sight of Pac-Man and the Ghostly Adventures’ teenage dweeb — but I’d still rather not be locked in the same room as this American abomination; really, I don’t think those eyes stem from too much alcohol, if you catch my drift. Wait, did I just say Midway? 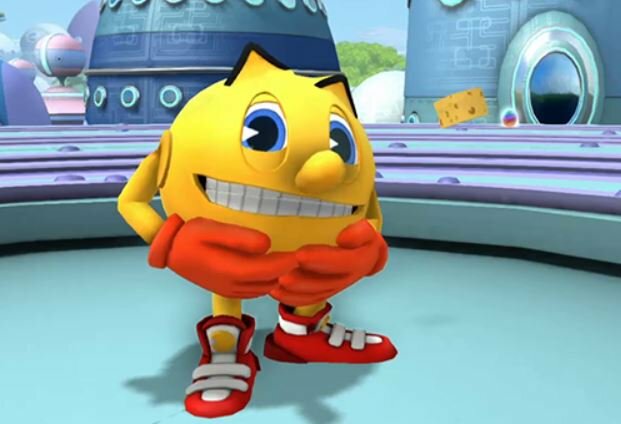 Wasn’t Pac-Man what put Namco onto the arcade map? Well, yes and no. While gaming giant Namco originally developed and published the legendary eating game in Japan, the absence of an American branch granted a license to the now-defunct Midway. (As it happens, Midway itself was responsible for Ms. Pac-Man, but that’s a story for another time.) The origins of Pac-Man himself has changed throughout the years — while creator Toru Iwatani did share the famous tale of the character’s inspiration via a missing slice of pizza, he admits that’s not the whole story, as experimentation with the Japanese kanji for mouth (口, “kuchi”) produced a more rounded shape. Meanwhile, as awkwardly illustrated in this Scott Pilgrim vs. The World scene, Japanese wordplay (“paku-paku,” their onomatopoeia for eating) also inspired the original “PuckMan” name. Scrubbed for American audiences in fear of vandalism (here’s a hint: what Western swear rhymes with “puck”? ), the localized “Pac-Man” moniker somehow stuck. But what about the whole “eating” concept? Believe it or not, that arose from idealism on Mr. Iwatani’s part — he’d noted the current arcade scene largely consisted of violent war/alien shooters, restricted them as men-dominated spaces. Thinking of what could draw both women and couples, he drew upon his wife’s love of munching desserts and sallied forth with the “cute” game everyone knows: a pellet-filled maze where four ghosts — Inky, Blinky, Pinky, and Clyde — endlessly chase down our round hero as he devours dots, fruit, and even his own pursuers. A sight for nostalgic eyes. Every last facet meticulously demands the player’s attention: the claustrophobic maze instantly dictates its pellet-gobbling goal, the color-coded ghosts (a design decision nearly reversed by former Namco president Masaya Nakamura — had he had his way, all would’ve been a homogenized red) make the game pop and imply their respective behaviors, and the collectible fruit are literal forbidden fruit — treats not necessary for completion, but enticing all the same for higher scores. 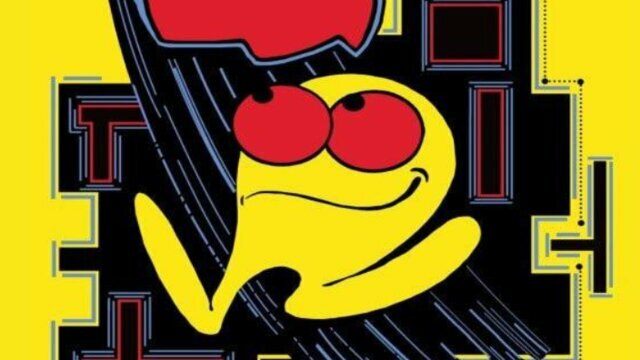 Even if you’ve never played it, you know what Pac-Man is — it’s as ingrained into public consciousness as Super Mario Bros., Space Invaders, and Donkey Kong. A timeless venture that’s swallowed countless quarters, although I can’t recall if any hailed from my wallet; if anything, considering a) Namco Museum exists and b) how much I stink at Pac-Man, I’d rather count my blessings. I say this despite knowing the secret to success is, as brilliantly illustrated within Jeremy Pittman’s Pac-Man Dossier, analyzing the ghost patterns — Blinky (Red) chases, Pinky (Pink) ambushes, Clyde (Orange) does whatever, and Inky (Blue) alternates between all three — but I cannot for the life of me pull that off. I can multitask and snappily adjust within the modern, hyperactive chaos of Smash Bros. and Mario Kart, yet I crack under pressure when it comes to keeping track of four unique ghost behaviors as I shift dot-eating routes on a dime, their habits blurring into one predatory mob loosening my focus. My high score of 25,000 may impress a casual observer, but for myself, it’s an emblem of frustration — a lingering resentment against my jittery, amateurish gluttony. But what flexibility this game presents, and all within such confined space! Iwatani’s emphasis on “tension” is well-founded — the ghosts grow ever faster with each round, and our one weapon — the Power Pellet, which renders the ghosts eatable — weakens over time. 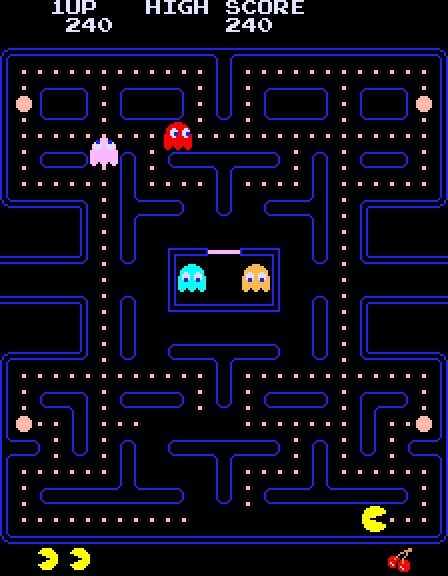 Even if you don’t pick up on the ghosts’ habits, Pac-Man naturally feeds into strategy — for instance, as we flee the top-left corner when the ghosts close in, a careful player who didn’t yet pick up the Power Pellet may reserve it as a future trump card. 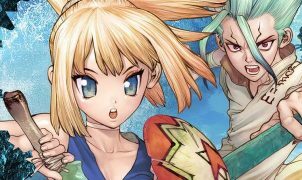 Building upon that, a more dedicated, eagle-eyed player may recognize Pinky occasionally retreats towards that niche, and only that niche, alone. Pittman’s tactic of “baiting” Pinky’s ambushes may be too intimidating for some, but this one realization can permanently mold our approach. Of course, that’s hardly saying such approaches are immune from gaffes, and what better example than the aforementioned “forbidden” fruit? That no dots surround their spawning spot — just beneath the ghost “house,” where the four fiends file out — is elaborate: its emptiness signifies not merely their optional status, but as a potential waste of time; really, why bother eating healthy when we could be focusing on the ever-vital pellets? But for the high score-prone or those desperately seeking the game’s one-and-only 1-up — available at 10,000 points — they’re invaluable to both progress and survival. Will our momentary detour prove beneficial, or spell our doom? Like something out of a horror movie. My only experience with these ports is the 1993 NES version — the late date’s a head-scratcher, but although Namco’s absence of an American partner initially halted localization of the 1984 Famicom original, that didn’t stop Tengen tomfoolery in producing unlicensed NES carts. 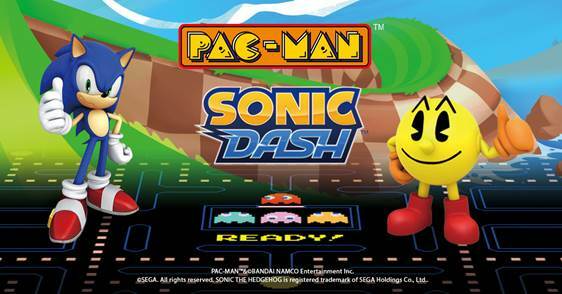 Having played it via NES Classic, it’s fine, but anyone familiar with the original arcade release should recognize its relative clunkiness — Pac-Man’s movement lacks its familiar snappiness, and the inconsistent color scheme from full neon (the blue maze) to pale facsimiles (the ghosts/fruits) aren’t easy on the eyes. A well-meaning port, yet an imposter all the same. There’s far too many re-releases and ports over the past three — wow, nearly four! — decades to keep track, but it’s not unfair to assume the original remains the strongest. In short, Pac-Man is pure video game, its succinct balance of impulse and strategy surviving awkward reboots in Pac-Man 2: The New Adventures and Pac-Man World. It instead endures via Pac-Man Battle Royale — my favorite Dave & Buster’s attraction — and Pac-Man Championship Edition DX — games that smartly build upon the original rather than copying competitors. Mario and Donkey Kong have journeyed on to revolutionary adventures complemented via live concerts and media empires, but Pac-Man’s content with his retro playground — his humble mischievousness that, as curator Chris Melissino elaborated for the Smithsonian American Art Museum’s The Art of Video Games exhibit, pervaded pop culture and defined video games for the aspiring artist, the burgeoning industry, and curious passerby who didn’t know their buttons from their joysticks.